Llandanwg Beach BeachLlandanwg beach is just south of Harlech and is accessible by a path through the dunes from a car park. This west facing, shallow shelving beach is a part of the Snowdonia National Park. Nearby Mochras, better known as Shell Island, is a popular spot accessible by low-tide causeway, with a beach, dunes and an amazing variety of shells. On Shell Island you will find a large sandy beach, variety of wild flowers and breath-taking views. The beach is sheltered from strong winds, making it a perfect place for relaxation. It's popular with fishermen; the local catch includes dogfish, bass, flatfish and mackerel. The village of Llandanwg is famous for its church which stands just a stone's throw from the sea. 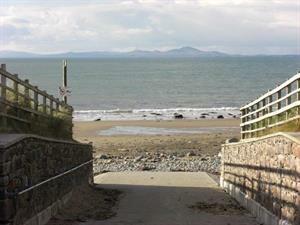 Llandanwg beach is just south of Harlech and is accessible by a path through the dunes from a car park. This west facing, shallow shelving beach is a part of the Snowdonia National Park. Nearby Mochras, better known as Shell Island, is a popular spot accessible by low-tide causeway, with a beach, dunes and an amazing variety of shells. On Shell Island you will find a large sandy beach, variety of wild flowers and breath-taking views. The beach is sheltered from strong winds, making it a perfect place for relaxation. It's popular with fishermen; the local catch includes dogfish, bass, flatfish and mackerel. Toilets and parking. Dog restrictions apply April to end September. Turn off the A496 just south of Harlech where signed to Llandanwg; this road leads to the beach car park.